better than I so I throw her in front of the camera often. We had great fun using a collection of old lamps and a heating lamp. Anton’s camera is, however, better than mine as the following picture will attest. The following picture is Anton’s of the same section. I think I’ll ask him to shoot everything from now on. 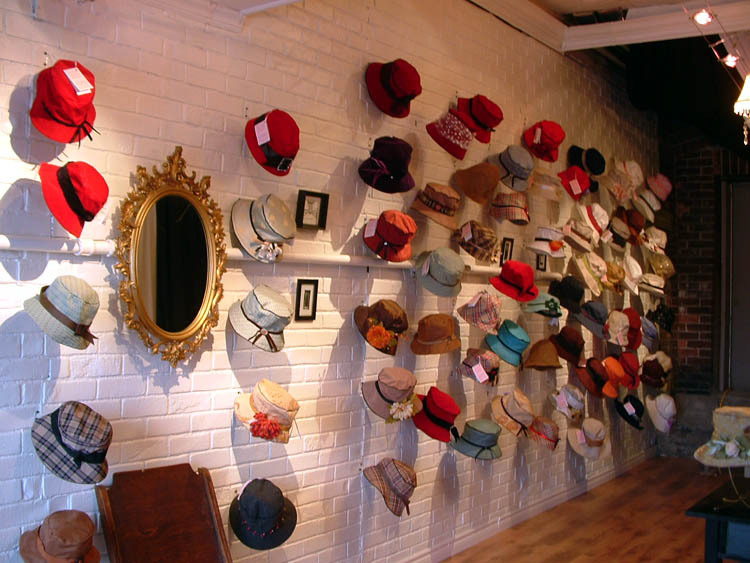 Posted in Card Catalogue, In The Shop and tagged Anton Volek, Barrie, Handmade, Hats, Lakeshore Mews, Le Petit Chapeau, Millinery, Photo-shoot, Vintage wedding dress, Women's Accessories. Bookmark the permalink. I imagine you might be realizing that a baseball cap just isn’t my thing by now. I love the way a tricorn looks. For those of you who aren’t sure what a tricorn is it’s a round crown hat with its brim folded up on three sides to make a triangle shape when looking at it from the plan view. Tri-corn, three horns. get it? I have made several cocktail tricorns. These are fun and look great when one point sits jauntily over one eye. It has to have a skull. I’m not sure a hat like this could have been made without at least one with a skull. I decided to go for a more traditional french look with this and the next one. I love the way these look and when I have a bit of time to play I will definitely make a few more. I think I’ll make one in embroidered silk next time. 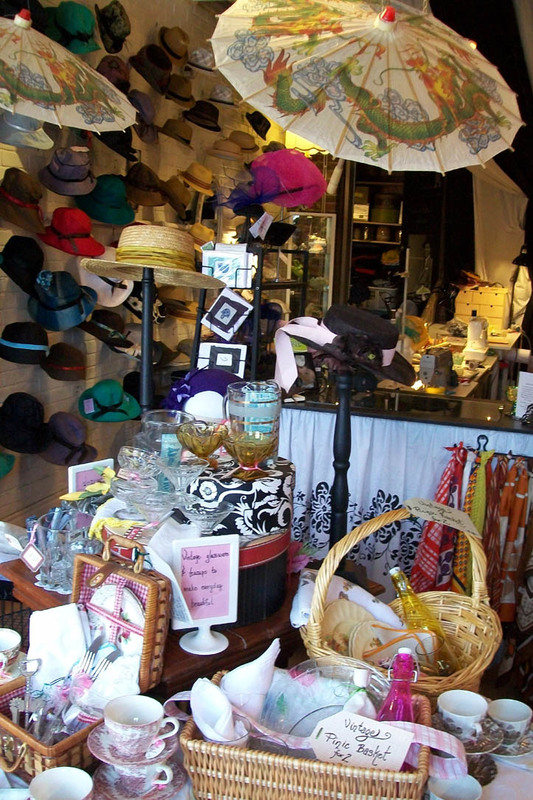 Posted in Card Catalogue, In The Shop and tagged Accessories, French, Handmade, Hats, Ladies Day, Lakeshore Mews, Le Petit Chapeau, Millinery, pirate hat, skull, Tricorn, Women's Accessories. Bookmark the permalink. Top Hats, my love affair. I love top hats. I always have. It might be I was the kid in dance class and took any opportunity to be on stage. I have a soft spot for the theatrical and vintage circus things so top hats just fall right into that space. I have made quite a few and this past spring finally created a pattern that only takes a few hours to execute a finished hat as opposed to days as this one above did. I loved this one. Unfortunately I loaned it out to a stylist, it was destroyed and somehow I never was reimbursed. Oh well. Lesson learned. Of course I had to figure out how to make this one. Yes I have the pattern and yes I will make you one. Although this fabric proved to be too flimsy and I would make the next one out of a heavier weight. It was more important that I was true to the original drawing since I made it for a fundraiser. It really is a 10/6. Sara at a bridal show in a vintage pop up top hat. Yes we really do wear them. This is a vintage one that is my baby. I rescued it from a damp costume storage from a different life before I was a milliner full-time. I will keep making them, all one of a kind. If not the fabric then the decoration. I just made embroidered taffeta in cranberry red with olive sash and black embroidered with tan cockade. I think I will make another mad hatter 10/6. I’m not sure what I’ll wear it with though. 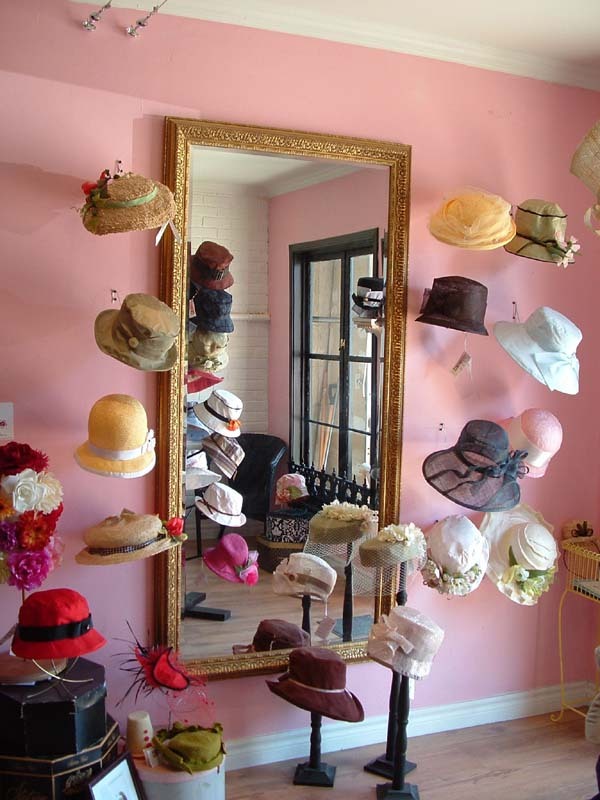 Posted in Card Catalogue, In The Shop and tagged Accessories, Alice in wonderland, Handmade, Hats, Lakeshore Mews, Le Petit Chapeau, Millinery, taffeta, top hats, velvet, wedding show, Women's Accessories. Bookmark the permalink. I decided to cut out more faux fur. This time I’ve decided hats. I know, weird to make hats. They are much like a classic Russian fur hat and as of today I have pink bunny and black/brown rabbit. More to come and they are super warm. Posted in In The Shop and tagged Accessories, Barrie, Faux Fur, Hats, Lakeshore Mews, Le Petit Chapeau, Millinery, Ontario, Women's Accessories. Bookmark the permalink. What a difference 6 years makes. 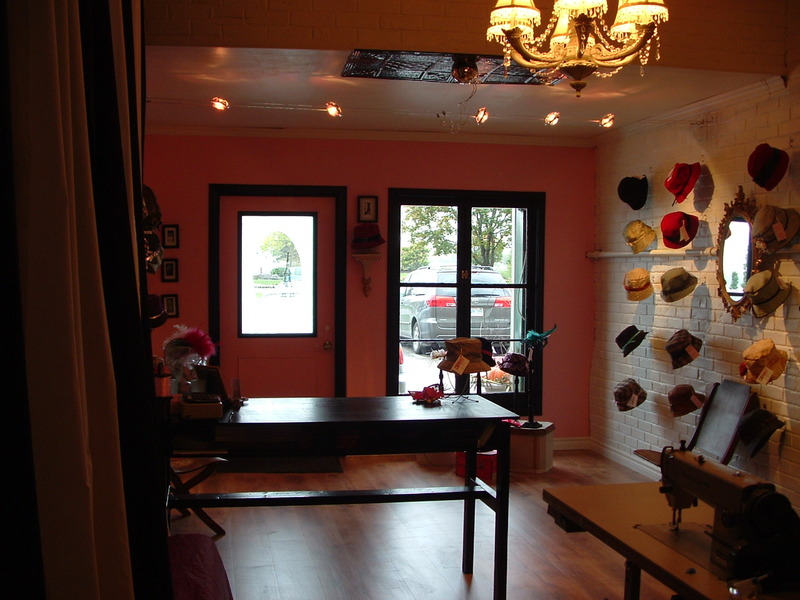 I opened my studio shop 6 years ago on Canadian thanksgiving weekend. I remember the 4 months of renovating the space from an old garage to what it was as well as Chris and I working full-time on other projects. I took some pictures on that first day. The window display. I had so much room around it that day! I belive I had 6 cocktail hats when I opened. Now it’s half my stock! This is just as you walk in the door in the fall of 2009. It still seems so open and the original pink is still on the wall. 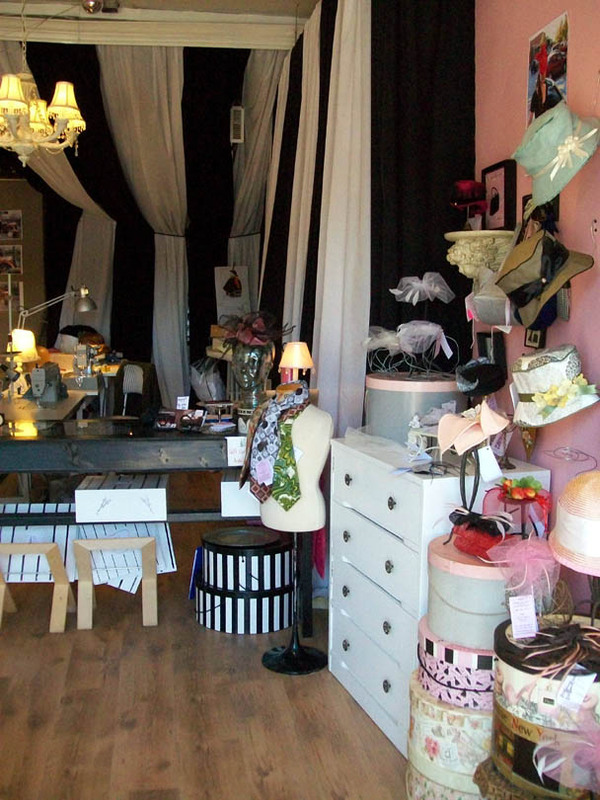 The location of my shop is on a mews which, since the building I’m in is on a hill, runs behind the buildings on the historical main street of Barrie ON. Canada. The city has made enormous changes to the area and several other galleries and studios have opened up since I moved in. So many changes that the city declared it the “art hub” of the city. I don’t know about that but I’ll take the free advertising. Since I am at the back in what used to be a garage I have a large green wooden garage door I pull down when I’m not open for security reasons. The fall of 2009, I think, found this door, at 60 years old, finally broken and that meant ripping down a large portion of the fancy carpentry I created to have an exterior wall inside a garage door. That is when the paint changed to deep hot pink. I might go back to this vintage pink some day. This is what the shop/studio looked like in July of this past year. Soooo full of such great things. I love it. Changes in the studio have come slowly much like the changes in my designs and fabric choices. Sometimes a good thing shouldn’t be tampered with too much. The front of the shop looks essentially the same. different urns and a new sign based on the old one. I was speaking with my carpenter in residence and asked how he felt about making me a square bay window and getting a blacksmith to make a security gate instead of a garage door so people can look into the window when we are closed. He grunted knowing now that the snow is flying he’s off the hook until the warm weather. 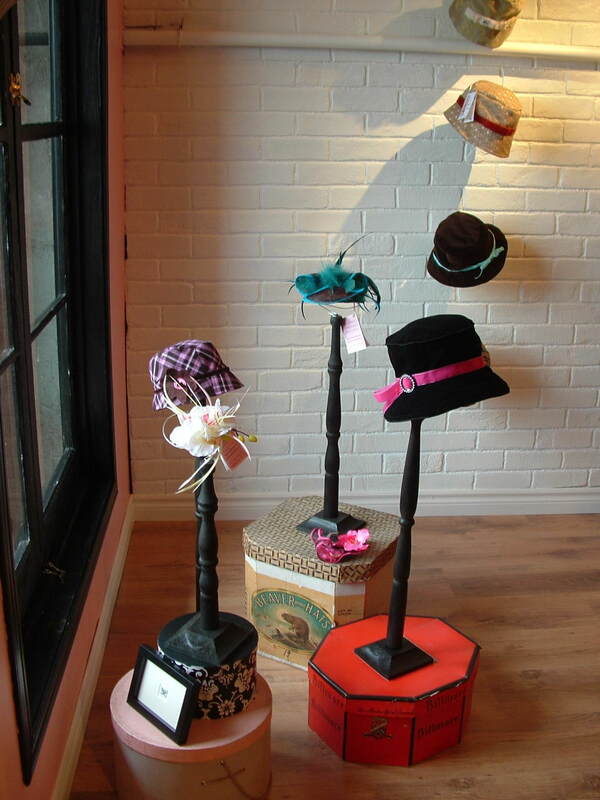 Posted in In The Shop and tagged Accessories, Artistis Hub, Barrie, Canada., Canadian Thanksgiving, Display, fall 2006, Handmade, Hats, Lakeshore Mews, Le Petit Chapeau, Onatrio, Studio, vintage, Vintage Accessories, Women's Accessories. Bookmark the permalink. all the good little girls and boys. There are other verses but that all I can think of. I’ve tried searching this but am having no luck. It’s three women that sing it but it’s not anyone I recognize. If anyone out there has heard this song, can lead me to it or knows where to look I’d love to know. It really isn’t Christmas until I hear it. (I suppose I can make Sara crazy by singing the only verse I remember until she begs me to stop.) As an aside, I’m Canadian and I’ve never been to Santa Fe so although for all you southern states folks it doesn’t seem weird you’ll have to trust me when I say it’s a bit strange here. Here’s hoping for a Santa Fe Christmas to start the season! Posted in Card Catalogue and tagged Christmas songs, Hats, Le Petit Chapeau, Millinery, Santa Fe, Vintage Accessories, Women's Accessories. Bookmark the permalink. It would seem that there is nothing in this world that irritates me more than when I put something on and it doesn’t fit properly. So I expect to have to make alterations to most pieces of clothing that I buy and most of the time I do have to. I understand that this lack of ‘fit’ is due to trend and mass production. There is one thing however that I expect to still fit like a glove, and that would be a glove. Every new pair of gloves that I pull onto my hands leaves a lot to be desired, most fingers are too short, nine times out of ten all different sizes and nothing fits right. Thus I do not own a single new glove. Inevitably I fall back to my vintage collection. I love the way they fit, the way they feel and the way they make my hands look. I am not dressed to leave my house in the mornings without a pair on even in the summer. The only downside to vintage gloves is how difficult it is to find a leather pair that are larger than a 6 3/4 and in good enough condition to wear. 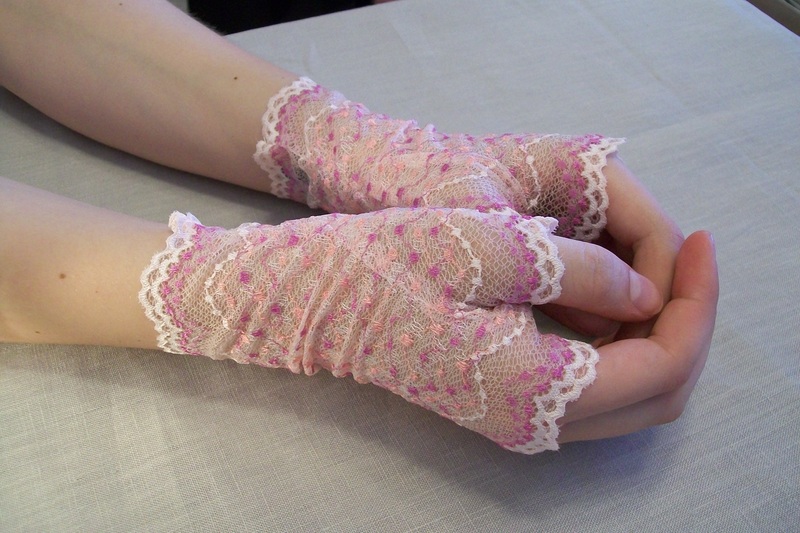 Out of this frustration I decided that my only course of action was to teach myself to make gloves the right way with proper fitting. This way at very least I could have a leather pair that fit like a glove should. 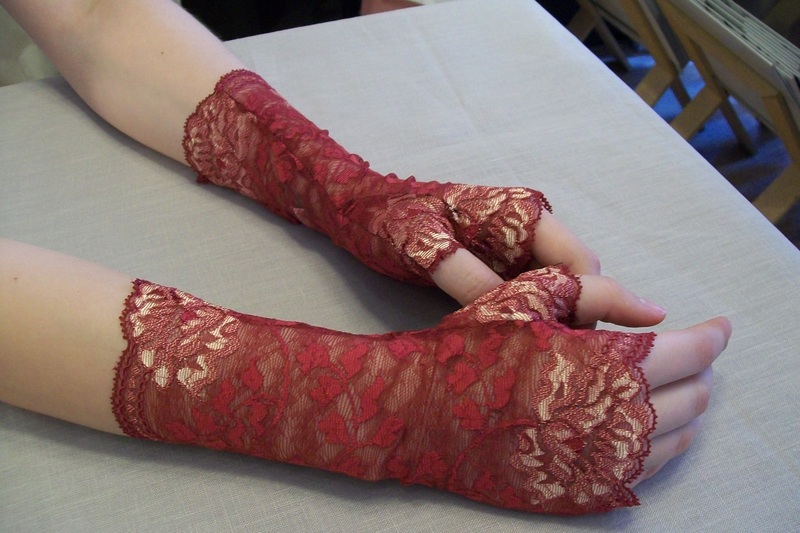 I started with lace gauntlets, something simple I thought, with no fingers. It took some work to draft a successful pattern and then teach my fingers how to hold the fabric. With great pleasure I now make them for the shop. As it turns out, they are incredibly difficult to photograph. It’s no surprise that Meaghan managed to find a way to make them look good. There are far more colours than just these three and they are all available at the shop in two sizes. We will be listing them on our etsy site shortly. 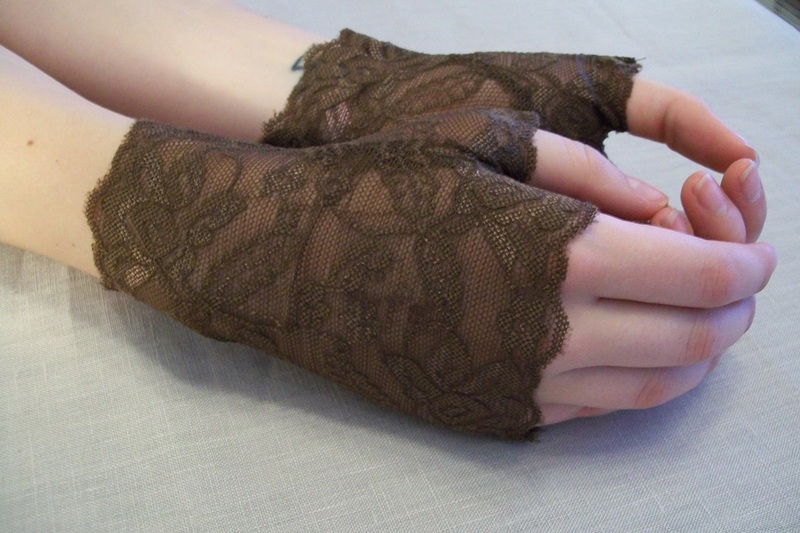 Posted in In The Shop and tagged Accessories, Etsy, Gloves, Lace Gauntlets, Le Petit Chapeau, Vintage Accessories, Vintage Gloves, Women's Accessories. Bookmark the permalink.